Featuring dynamic, dancing flames, the Real Fyre G52 Radiant Fyre gas log system delivers comforting warmth to remove the chill of a cold evening. 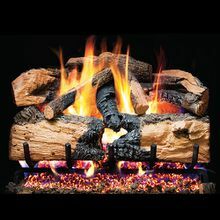 Molded with an exclusive fiber enhanced refractory ceramic mix, the handcrafted Charred Evergreen Split Oak logs showcase finely detailed bark and nature's varied color highlights. When lit, the glowing logs and flickering embers replicate the beauty of a wood fire. Product Sizes: 18", 24", 30"